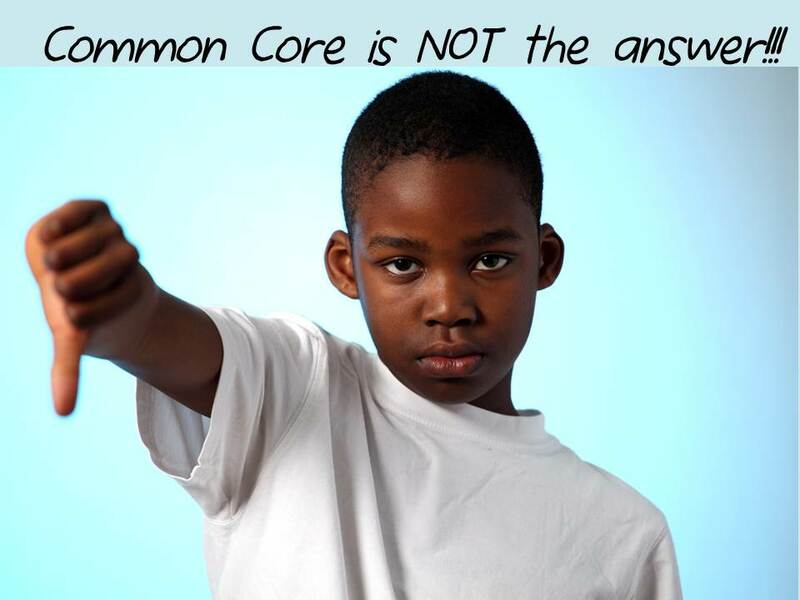 At the “core” of Common Core is government control, both of students and States. Please join the state-wide effort to resist the implementation of Common Core in North Carolina. Of course, I hope this article will encourage those in other states to do the same. How many North Carolinians know that public school education in the state is centered around the government’s Common Core initiative? As of February of this year, only about 20 percent had even heard of the term Common Core. Far fewer were aware of the implications of Common Core on education. The Common Core State Standards Initiative (Common Core) is a US Department of Education initiative that seeks to bring diverse state curricula into alignment with each other by following the principles of standards-based education reform. Although the Common Core establishment promoted the standards as a “state-based initiative,” the truth is that it is anything but that. It is a government-based, centralized, top-down, one-size-fits-all national education initiative disguised as a state initiative. In 2010, North Carolina adopted Common Core standards in mathematics and English language arts. The standards were released in June of that year. Like almost every other state, North Carolina quickly adopted the standards without looking into its merits. Almost three years later, the state Board of Education and state legislators still have not looked into its merits. Instead, they continue to be blinded by the funding element and sold on the lies that the government and its associates have promoted. The time is NOW to start digging into the merits of Common Core, as well as its criticisms. The hope is that as people begin to learn the truth about this initiative, they will join the effort to resist its implementation in North Carolina. A campaign has been organized for this effort, a resolution has been drafted, many groups are adopting it, and soon our state legislators will be introduced to this resistance. The resolution is attached below and if you think it would be wise to halt implementation of Common Core in North Carolina while parents, citizens, legislators, educators, and state officials have an opportunity to address the many valid and serious concerns (outlined in the resolution), we ask that you attach your name to it. On July 24, 2009, President Obama and Secretary of Education Arne Duncan announced there would be federal “Race to the Top” competitive grants available to states for education reform. To be eligible, states had to adopt “internationally benchmarked standards and assessments that prepare students for success in college and the work place.” Once the Common Core standards were released, which was on June 2, 2010, the US Department of Education told the states that in order to continue to be eligible for these grants – this federal funding for education – the states had to adopt them. 45 states have adopted Common Core at this point and the government is planning to fully implement this initiative by 2015 by requiring that each state base at least 85% of its education curricula on the Standards. How did Common Core come about? As most people are aware, the No Child Left Behind Act of 2001 (NCLB), the initiative put forth by President George Bush, marked the most dramatic expansion of the federal government’s role in public education in nearly 40 years. Breaking from the government’s traditionally limited role in the daily lives of American school children, NCLB placed specific demands on states and school districts – forcing them to hold schools accountable for failing students, requiring them to monitor student progress annually or face consequences, mandating tougher hiring practices for teachers, and instituting penalties for schools that failed to improve. The penalty provision of the NCLB was the real meat of the initiative. A school that failed to meet the NCLB standards for 3 consecutive years would not be entitled to federal funding. Up until Common Core, No Child Left Behind was the latest revision of the Elementary and Secondary Education Act of 1965 (ESEA), which was the very first federal education law. It was developed and enacted as part of President Johnson’s “War on Poverty” in order to provide significant levels of funding to schools. In the beginning, ESEA allocated $1 billion a year to help subsidize schools with high numbers of low-income students. It funded Head Start, a preschool program that helped poor children prepare for first grade. It later budgeted an estimated $11 billion to $13 billion a year to help kindergarten through 12th grade schools in poor communities. The provisions of the law also included funds for professional development for teachers and programs designed to increase parent involvement. As President Johnson said the day the bill was passed: “It will offer new hope to tens of thousands of youngsters who need attention before they ever enroll in the first grade.” He continued, “It will help 5 million children of poor families overcome their greatest barrier to progress: poverty.” Indeed, ESEA’s most far reaching program, Title I: Aid to Disadvantaged Children, earmarked $8 billion a year to special education and impoverished and homeless children. In the classroom, ESEA required the Department of Education to administer the National Assessment of Educational Progress (NAEP) test, an assessment of fourth, eighth and 12th graders from randomly chosen schools, both public and private, across the country. The test, commonly referred to as “The Nation’s Report Card,” sought to give lawmakers a measure of national achievement by subgroups, such as female and Hispanic students, but did not assess all the nation’s schools. Major disparities between the reading and math scores of students in economically disadvantaged school districts and the scores of students in more affluent communities raised concerns, and this led to a revision of the law in 1994 by the Clinton administration. The revised law was called The Improving America’s Schools Act (IASA). IASA increased school funding to cover additional programs for disadvantaged students and required states to increase the number of student assessment tests to once in grades 3-5, 6-9 and 10-12. Under the law, states were asked to impose their own standardized test requirements for disadvantaged students, who, under the previous law, did not have to be tested. Despite what lawmakers hoped would be a turnaround in academic proficiency under IASA, NAEP scores continued to show a wide achievement gap by race and socio-economic status. While some schools and districts took pains to ensure their students passed progress tests, others did not. In 1998, only 60 percent of fourth graders performed at or above the “basic” level of NAEP and only 30 percent of eighth graders and 40 percent of the nation’s 12th graders scored at or above the “proficient” or average level, according to the National Center for Education Statistics. The same year, the test still showed major performance gaps between white students (who scored higher on the tests) and black, Hispanic, and American Indian students. The No Child Left Behind Act, signed by President Bush on January 8, 2002, initially received praise from Republicans and Democrats alike. Both sides saw the new law as providing basic tools to give the country’s most disadvantaged children (who go to school in some of the poorest districts) a very real opportunity at a quality public school education. As mentioned earlier, the act initiated a coordination of state and federal policy with the goal of improving teachers and students by penalizing schools whose standardized test scores did not improve rapidly enough. Since its passage, however, many Republicans and Democrats who initially supported the bill have joined critics who condemn the law for imposing unrealistic expectations on schools and failing to provide sufficient funds to make the required improvements. By 2005, least 10 state legislatures tried to roll back parts of the law and at least three states took steps to exempt themselves from some of the act’s provisions. Even before George Bush proposed No Child Left Behind, the “Education Accountability Movement” was gaining momentum. The movement advocated for a common core of knowledge that all citizens should have in order to be successful in the nation’s workforce and they wanted mandatory testing of student achievement in order to achieve that goal. As part of this bold education reform movement, the nation’s governors and corporate leaders founded Achieve, Inc, a bi-partisan organization to raise academic standards, graduation requirements, improve assessments, and strengthen accountability in all 50 states. The year was 1996. Then in 2004, a report was published, titled “Ready or Not: Creating a High School Diploma That Counts,” which found that both employers and colleges are demanding more of high school graduates than in the past. According to Achieve, Inc., “current high-school exit expectations fall well short of what employers and colleges demand.” The report concluded that the major problem currently facing the American school system is that high school graduates were not provided with the skills and knowledge they needed to succeed. As the introduction to the report announced: “While students and their parents may still believe that the diploma reflects adequate preparation for the intellectual demands of adult life, in reality it falls far short of this common-sense goal.” It alleged that a high school diploma no longer holds the value it used to because graduates could not compete successfully beyond high school. The report went on the conclude that the solution to this problem is a common set of rigorous standards. The stage was set for Common Core. The development and promotion of the Common Core standards was a joint effort spearheaded by the National Governors Association Center for Best Practices (NGA) and the Council of Chief State School Officers (CCSSO). The NGA and CCSSO coordinated the development process in partnership with Achieve, Inc. In 2009, the NGA hired David Coleman, a businessman (not an educator) and a progressive, and Student Achievement to write curriculum standards in the areas of literacy and mathematics instruction. David Coleman, who despises classic literature and its teaching, is the chief architect of the Common Core standards. He is also listed as one of the top 10 scariest people involved with education reform. As it was announced on June 1, 2009, the initiative’s stated purpose would be to “provide a consistent, clear understanding of what students are expected to learn, so teachers and parents know what they need to do to help them.” With respect to the standards that were created, it was explained that: “The standards are designed to be robust and relevant to the real world, reflecting the knowledge and skills that our young people need for success in college and careers, which will place American students in a position in which they can compete in a global economy.” A year later, on June 2, the standards were released. While both the NGA and CCSSO appear to be state-based organizations, the reality is that both are DC-based trade associations (organizations founded and funded by businesses that operate in a specific industry). And Achieve, Inc, the group tasked with “raising academic standards and graduation requirements, improving assessments, and strengthening accountability” is actually a progressive non-profit group based out of DC which receives much of its funding by the Bill and Melinda Gates Foundation. (Bill and Melinda Gates are super liberals). The truth is that the Melinda and Bill Gates Foundation planned and funded all the development, did all the reviewing, and is now involved in the promotion of the Common Core, including selecting most of the figures on the various development committees. It is also worth noting that since creating the Common Core standards, David Coleman has recently been promoted to president of the College Board. As president, he has promised to align the SAT with the Common Core standards he created. First, he used his progressive education philosophy to hijack education for K-12 students and now he’s plotting it for post-secondary students as well. As mentioned earlier, the Common Core State standards are scheduled to go into effect in 2014 and to be fully implemented (with testing) by 2015. The 45 states that have adopted the program are currently phasing in the programs reforms. The standards released so far are in math and English language arts, but they will soon extend to science and then history (social studies). Four states so far have either not adopted Common Core or have dropped out – Nebraska, Alaska, Texas, and Virginia. Alabama has introduced repeal legislation and now Kansas and Oklahoma are doing the same. Oklahoma took the first step in passing a bill (House Bill 1989) which will prohibit the sharing of its students’ personal information. Minnesota has only adopted the English language arts standards. And Indiana has recently passed legislation – a Common Core “Pause” Bill – that puts a pause on the implementation of Common Core in the state so that legislators, parents, teachers and school boards can have the time they were denied previously, to actually vet and analyze the Common Core agenda. The bill, in part, reads: “After May 15, 2013, the state board may take no further actions to implement as standards for the state or direct the department to implement any common core standards developed by the Common Core State Standards Initiative until the state board conducts a comprehensive evaluation of the common core standards.” Indiana’s Governor Mike Pence, skeptical of Common Core, says the standards are less rigorous than Indiana’s prior standards and adopting them would mean giving up too much power over the setting of standards. North Carolina adopted Common Core on June 4, 2010. That was only two days after the standards were released by the NGA and the CCSSO. The NC Board of Education adopted it unanimously because it didn’t want to lose the federal “Race to the Top” funding. The state legislature didn’t vote on it, nor have they taken any serious steps to put the brakes on its implementation. In fact, that’s been the case in 45 states. Common Core was presented to the states at a time when the government knew the state legislatures would be out of session or beyond the point when they would entertain new legislation (the summer). The NGA and CCSSO knew they would have a better chance with the state boards of education, which are typically more liberal and progressive and like standards-based curriculum. And that’s what happened here in NC. States didn’t want to lose the federal funding and therefore didn’t do the due diligence in researching the Common Core standards. If they had done so, they would have learned that almost everything the CC establishment has saying about it is a lie. North Carolina schools began implementing the math and English language arts standards in the fall of 2012, although Common Core will fully go into effect in 2014-2015 when the tests (funded by the federal government) are provided. At this time, most NC legislators think we are already too far down the road with Common Core and too dependent on federal education funding to break free and opt out. Opting out would require one of two actions: (i) a decision by the state Board of Education (which would actually be feasible since many of the members who supported Common Core have been removed from the Board by newly-elected Republican Governor Pat McCrory and replaced with those who are skeptical of it); or (ii) action by the NC General Assembly to opt out (and refuse funding) or halt implementation. In April 2013, NC house members passéd House Bill 733 (H.B. 733) which creates a 20-member committee to study the Common Core standards and to make a report to the legislature in 2014 and 2015 and to make a final report in 2016, at which time the committee will be dismantled. If the bill called for a 1-year study, critics might be able to conclude that NC legislators are serious about figuring out if Common Core is good for its students and stopping a potentially bad program, but since the study is much longer and since Common Core will continue to be implemented and more firmly entrenched during that entire time, the bill is simply a diversionary tactic and only gives the illusion that our state legislature has good intentions. By the time the study is complete, Common Core will have established national standards and testing in all subjects. An initiative has been organized to oppose the implementation of Common Core in North Carolina and ultimately to seek that it be rejected for our public schools. It is the belief of those who have spent time researching the standards that Common Core is a one-size-fits-all education agenda to nationalize education standards and then, by extension (and through the testing scheme), to control public school curriculum. The intention is to collect resolutions from as many groups around the state who want the brakes put on implementation of Common Core in North Carolina and then use them to put the pressure on our state legislature and state Board of Education. I hope this information will encourage those in other states to organize opposition as well. For those who live in North Carolina, please read the Resolution below and if you agree or simply want to err on the side of caution and provide more time for due diligence, please agree to add your name to it. Also, please share with as many people as you can. Once all signatures are collected, we will organize a day when groups can meet at the state legislature and together present the resolutions to all of our legislators. To add your name, please contact Diane Rufino – crazy_for_the_80s@yahoo.com (and put “COMMON CORE RESOLUTION” in the subject line). Please include which town or county you live in and if you belong to any special organizations. WHEREAS, Common Core is being promoted as a “state initiative,” that description is merely offered to give the public the illusion that the agenda is “state-led.” Common Core standards were actually initiated by private interests in Washington DC and not by state lawmakers. Both the NGA and the CCSSO are both DC-based trade associations (organizations founded and funded by businesses that operate in a specific industry) which used ACHIEVE, Inc. to do the creative work. ACHIEVE, Inc. is a progressive non-profit group based out of DC which has received much of its funding by the Bill and Melinda Gates Foundation. WHEREAS, Common Core will force consistency and uniformity across the nation. As long as the States are bribed and coerced into adopting a national one-size-fits-all education scheme, then education in general will suffer severely because the states, as 50 independent laboratories of experimentation, will be precluded from trying to innovate and improve education and find solutions to the problems that plague our current education system (in other words, this imposed uniformity will stifle the innovation that federalism fosters). RESOLVED, that the _______________________ (name of group) urges our Legislators to get further involved in the current debate over Common Core, to halt implementation of the standards while a state initiative is pursued to do due diligence and perhaps take an independent state-based approach to the improvement of our education system, and to eventually introduce legislation to remove this system permanently from our schools in North Carolina. This entry was posted in Uncategorized and tagged CCSSO, Common Core, David Coleman, education standards, national standards, NGA, resolution, state initiative. Bookmark the permalink.